A detailed review of this book was done for the February, 2013 edition of The Living Tradition magazine. An interview was also done for RTÉ 1 radio’s Arts Show. In order to understand it better it was necessary not just to read content, but to have statistics upon which to base comment. These were extracted in the traditional (journalistic) manner with a ruler and an abacus. Data which has appeared in print in The Living Tradition, February, 2013, is not included here now, but will be posted next month. The RTÉ radio programme is worth listening to online – on the RTÉ player. Prof. Mícheál Súilleabháin also reviewed the EMIR in The Irish Times, on Nov. 30th, 2013, and the following information was posted on the paper’s online edition. John Moulden has reviewed it too for An Píobaire, journal of Na Píobairí Uilleann. The encyclopedia is descriptive and analytical (it does not contain any music transcription or in-text imagery) and there are sixteen pages of colour images, three of which are of printed music scores. The two volumes have c. 900,000 words in 1080 pages of main text, with an additional 65 pages of index (c. 10k items), 20 pages of information and credits, and 13 of introduction. 69% (c.) of the text material (745 pages, 620k words, 1115 articles, average 560 words) is of Classical, Church and Musicology and related material. 25% (270 pages, 225k words, 570 articles, average length 400 words) is on Traditional (Irish) music. 6% (65 pages, 54k words, c. 235 individual pieces, average length c. 200 words) is on modern Popular/Rock musics. Classical, Church, Musicology etc. c. 172 pages (c. 143k words, 72% of all bibliography pages). Traditional c. 54 pages (c. 45k words, 23% of all bibliography pages). Pop/Rock 12 pages (c. 10k words, 5% of all bibliography pages). Biographical articles (c.1200) represent 62% of the total of c. 1930 discrete articles. Historical, documentary, opinion and musicological articles (c. 730) are 38% of the book. 60% of the biographies (c. 720) are Classical etc..
30% (c. 360) are Traditional..
55% of the non-biographical articles overall (c. 405) are Classical, etc. 30% (c. 215) are Traditional. The average article length is 470 words, but there is considerable variation, and the allocation of words to topics appears to be an indicator of relative importance in the overall picture presented in the cases of genre summaries (such as Jazz  versus Hip Hop ) or r/e economic strength and social acceptability (Indian music in Ireland  versus Rap ). The longer entries are typically impressive: biographies such as those on Michael Balfe (3.7k), Gerald Barry (c. 3.2k) and Seán Ó Riada (c. 2.5k) appropriate to their purpose. The space given to concepts and ideology is significant too, and generally very rewarding: ‘historiography’ has c. 2k, ‘Identity’ has c. 1.6k, ‘Traditional’ has (uniquely) a text-book swathe of 11k (over 13 pages – a major essay). Reading the EMIR shows the necessity of using some device – such as upper-case ‘T’, to set off what has become known as Traditional music. This is because in the adjectival sense, all of the music in this book is without doubt historically ‘traditional’, and ‘Irish’ by – variously – region, origins, practice, composition or adoption. That said, on the Irish-indigenous, ‘Traditional’ music, the encyclopedia has terrific material, in extensive analytical articles, as well as c. 360-odd biographies of Traditional music’s leading personalities, stylists and ideologues and 215 or so descriptive pieces which cover such as Traditional music in America and England, dance, song, transmission, gender issues, collection, revival, aesthetics, broadcasting and recording. Underlining Ó Súilleabháin’s Irish Times reservations however, the latter points up an unevenness or uncertainty with this genre. For while all aspects of Classical musicology, including the Churches, Marching- and Police-bands, are placed confidently in the alphabetic structure, Traditional music is not considered to be so familiar. The Journal of Music (formerly JMI) magazine which has been a critical voice in Traditional and Contemporary musics since 2000 is not listed (but is quoted by several writers). Labhrás Ó Murchú, a controversial and monumental figure in Irish music, who for some 45 years has been the Director of what has become the largest and longest-running music organization (of any kind) in Ireland, Comhaltas Ceoltóirí Éireann. Hot Press magazine, the fortnightly, hard-copy, 20k-per-fortnight-selling mainstream voice of Rock/Pop in Ireland over 36 years, edited by the (also unlisted) Niall Stokes, has but cursory comment at only 85 words, while the internal Journal of the Society for Musicology in Ireland, of which EMIR’s editors are founder-members, is (quite appropriately) allocated c. 200 words. The absence of political concepts which are key to understanding music in Ireland is less easy to accept. Such include: ‘Anglo-Irish’, ‘British’, ‘English’, ‘Imperial’, ‘ideology’, ‘Hiberno-English’, ‘Republican’, ‘Musicians’ Union’. A somewhat disappointing set of omissions, considering that ‘Loyalism’, ‘Orange Order’ and ‘Ulster-Scots’ are covered. Those absences shut out the active consideration of class, linguistic, cultural and political tensions between native and colonist, between the poor and the rising native middle class, Ireland and ‘the Crown’, the breadwinning musician and the theatre managers, which, since these are bound up with survival, opportunity, function, fashion and exclusion, are the very stuff of impetus and change – and visibility – in music. The Encyclopedia of Music in Ireland, edited by Harry White and Barra Boydell. Published by UCD Press, Dublin, October 2013. Price €110. From time to time one hears researched radio essays about curious aspects of recreational and devotional musics in 18th-19th-century Dublin, Belfast, Cork and the major Irish towns. Information on these can be found too in the various volumes of Irish Musical Studies, published by Four Courts Press since the early 1990s. A lot of this is of interest to, and important for understanding, Traditional music, but for its followers, historians, musicians and students and for those involved in Irish Studies, getting access to that kind of data in the one place has not yet been possible. The Encyclopedia of Music in Ireland (EMIR) addresses this, a resource that is a panoramic window on to formal and informal music-making on the island over some three centuries. The literate music traditions – early Classical, music in the Churches. Choral and the music of politics – dominate, but, developing the trend set by Irish Musical Studies, Irish indigenous (‘Traditional’) dance- and art-music and song are covered too. So too are issues debated among musicologists, ethnomusicologists, musicians and politicians, as well as, though slightly, the modern-day Popular forms. The review which follows addresses its specific Traditional music content. EMIR is a two-volume collection of c. 1900 items and 900k words of biography and research by 239 writers who worked to an editorial board of thirteen chaired by organist Gerard Gillen, supported by a team of nine advisory editors. It took a decade to complete, and was made possible by not only the considerable dedication of all of these and its executive editors Harry White and Barra Boydell, but by support from the National University at Maynooth’s €344k Atlantic Philanthropies grant in 2002, and a Senior Research Fellowship from the Irish Research Council in 2005. There are authoritative, eye-opening and record-straightening entries here, most on needed, and expected, topics and themes which do throw light on society over a period in which what we now call ‘Traditional’ was the popular music for the majority of the poorer (mostly rural-dwelling) classes on the island. But there are also many on surprising, delightful and quirky aspects of performance history. The two volumes have c. 69% of Classical, Church and Musicology, 25% on Traditional (Irish) music and 6% on modern Popular/Rock musics. The primary critique of any dictionary involves presences and absences – of particular categories or people; after that the word-count is assumed to reflect on significance and/or editorial preference. So, one wonders why Comhaltas Ceoltóirí Éireann’s D.G., Labhrás Ó Murchú is missing from biographical entries, as is also Adrian Scahill, the very section editor for Traditional music! Scahill had charge over a quarter of the book’s total content, and although thanked in acknowledgements, he does not appear in the credits page, and his biography is missing. Bad start that, but perhaps oversight of the obvious and IT error will bug any production of this scale, and seeming imbalances are of course inevitable too, for editors’ and critics’ priorities and judgments will differ. The space given to concepts and ideology in this book is significant, and ‘Traditional’ has a whopping, text-book swathe of 11k (over 13 pages – a major essay). The latter points to an unevenness or uncertainty with this genre, for while all aspects of Classical musicology, including the Churches. Marching and Police bands, are placed confidently in the alphabetic structure, Traditional music is not considered to be so familiar. For instance, one might have expected the terms ‘bands’ or ‘groups’ (the lingua franca in both Rock/Pop and Traditional) to be in the alphabetic listing, just as ‘orchestras’ appears alphabetically and not as a sub-category of ‘Art music’ or ‘Classical’. Neither of these latter two terms in fact are listed for definition, a critical absence perhaps, and presumably an editorial decision. But even though this is an encyclopedia and not a dictionary, since ‘Art’ and ‘Classical’ appear frequently in a genre sense over the course of articles, and are also applicable adjectivally to the top end of Traditional-music performance today, they may merit clarification here. The assumption in not doing so may be that they are perfectly common terms (which they may be indeed, but by rote, and, typically, are inadequately understood, as well as being challenged). The term ‘Traditional music’ however is no more clear or unclear, yet is (appropriately, and well) explained in great detail. Yet the book does not ignore the consequences of politics over the centuries; rather its modus operandi is to step back and observe, typically in meticulous data on music associated with each of the post-Reformation churches, on music business, and on not only all of the great volume of Anglo-Irish engagement with European Classical music, but also on the exploration of indigenous Irish melodies and forms by both musicians patronized by the Irish establishment elite and those composers in Britain and Europe who were fascinated by ‘ancient’ dance music and song. Thus we have a terrific résumé by Axel Klein on the fashionable ersatz and the researched orchestral and choral arrangements of indigenous Irish material, as well as the thematic use of Irish literature from 1790 onwards: Johann Fischer’s Gramachree Molly for flute and piano, Louis Spohr’s Potpourri of Irish Folksongs, Beethoven’s Irish Songs, Ferdinand Rise’s song settings, Frédéric Kalkbrenner’s Eighth Fantasia of Irish song, Nicolo Paganini’s 1831 Variations on St. Patrick’s Day, and, too, drawing on the 19th century fashionable popularity of the Irish Melodies of Thomas Moore whose ‘Last Rose of Summer’ we learn was greatly utilised, notably in Friedrich Von Flowow’s opera Martha in the opening year of the Irish Great Famine. 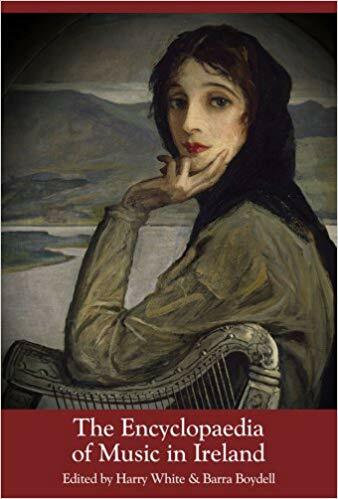 This popularity of distinctively-Irish material highlights a critical distinction in ‘Irishness’ which is raised elsewhere in this book, that between music which is indigenously Irish on the one hand, and people of Irish birth or domicile on the other. Thus Klein can note that while in modern times those Contemporary composers such as composer Gerald Barry can have an influence in movements in German music, this was not at all the case for earlier Irish-born, European-Art-music composers in the 19th century, due to “the lack of a sufficiently large number of eminent musical personalities among Irish immigrants”. A pointer indeed back to the Famine and the music of the Irish masses, an event which – as remarked on by editor White – resulted musically in what he (mis) quotes from collector George Petrie: a ‘great, unwonted silence’. It generated too an exodus to America and Britain of vast numbers of poor, dispropertied and damaged people who were not typically of the classes blessed by music education or European music experience. Among these were “countless numbers of undocumented musicians, singers and dancers” who are described through song by Gearóid Ó hAllmhuráin in what is the most traumatic article in the volume. That essay adjoins a biography on the Anglo-Irish folklorist and educationalist Alfred Perceval Graves, an alphabetic juxtaposition of the abandoned underprivileged and the sympathetic privileged which signposts not only the polarity of the fields of indigenous-Irish and Anglo-Irish/European music practices and repertoires which the EMIR addresses, but also – surprisingly perhaps – overlaps of interest among these. The encyclopedia has extensive analytical articles on Traditional music per se, as well as c. 360-odd biographies of that music’s leading personalities, stylists and ideologues. Among its 215 or so descriptive pieces is writing covering such as Traditional music in America and England, dance, song, transmission, gender issues, collection, revival, aesthetics, broadcasting and recording: superb ariticles by Scahill, song authority John Moulden and fiddler and Traditional-music University lecturer Martin Dowling stand out. These are a tremendous resource, a tribute to section-editor Scahill’s own writing and analytical skills as well as his planning, commissioning and editing. As with similar material on musicology in the book, the more academic of these are comprehensively text-book in style, providing a thematic and contextual cross-linking and balance which complement EMIR’s scale of vertical and lateral coverage. A weakness among this material is an underplaying of the scale of Traditional music performance in some of the ‘city’ articles, notably in that on Galway. Some of the analysis is ‘opinion’ in style, but it nevertheless invites observation and debate on key topics, even where some generalisations are questionable. One of the latter, on gender and Traditional music, might have had a different conclusion had it consulted competition results and reports and LCM and CCÉ music-grades exams statistics. Another concerns ‘Loyalism’ which, as a major player in political music without question should be covered. But its presence in any document on Ireland demands balance by giving equal weight to its raison d’être, ‘Republicanism’ which, though equally profoundly represented by song, is not covered in this book. This feels like a blinkering out of the anti-British ‘other’ in EMIR, and is reflected again on the entry on ‘Ulster-Scots music’ (a subject which is also in itself a vital and welcome placing). But, though the latter is valuable on present-day practices and cultural borrowing, the specific arguments made for it – as cited – are not historically accurate. Politics aside, the vital topics in Traditional music are covered descriptively in fine writing with succinct precision; the broader historical data on Classical forms, events and issues such as ‘Art song’, ‘music and literature’, ‘Masonic song’, ‘Medieval Ireland’, Manuscripts, ‘Modernism’, ‘Music publishing and printing’ and ‘Notation’ serve to provide a valuable contextual and complementary palette of information which applies across the genres – making sense indeed of some of what is now embedded in ‘Traditional’. Information quality is underpinned by the fact that the writers are mostly musicians themselves, and most are involved as academics in teaching in Universities and colleges. These are jobs which couldn’t have been dreamt of when Traditional-music revival got under way in the 1950s, but which passionate educators like uilleann piper and bandsman Seán Reid (covered in the text) likely hoped for as he argued successfully with Co. Clare Vocational Education Committee in the 1960s for teaching-space for music. It is a pity that the scale of the descriptive material limited in-text graphics, for the visual dimension would have been icing on the cake of such a fine set of information. Yet the middle sections of both volumes do contain beautifully-printed colour plates which relate to key subjects. A third of the total of 37 images represent each of Traditional-Irish, Classical and Church musics, and there are reproductions of historic notation (arranged and composed), ancient horns and crwth, programmes and posters. But it is the box-set’s graphic that is most stimulating. This uses the original painting from which was made the engraving on the 1928-1977 Irish currency notes which indicates the symbolic, idealistic and dogged musicality embodied in the harp as a political proxy. Since the image is not actually the likeness of an Irishwoman, but of an American who was the painter Sir John Lavery’s wife, a Chicago-born American who moved in high society, she could be stretched to represent the key resource and stimulation for Traditional-music revival which is embodied in the influential recordings made by Irish musicians who found new life in America; her Chicago background is a link too to the pivotal role in writing, music collection and publication which was played by that city’s onetime Chief of Police, Capt. Francis O’Neill in the re-popularisation and revival of Traditional music over the course of the 20th century (all of which is covered in the book).